Built in 1964 by Seager Fairbairn. A single span of 31′ crossing a pond outlet. Displays a Town truss. THIS BRIDGE IS CURRENTLY NOT OPEN TO VISITORS. The Erpf Covered Bridge is one of six covered bridges still standing in Delaware County. It is maintained by the owner and carries pedestrian traffic across a small spring run-off. 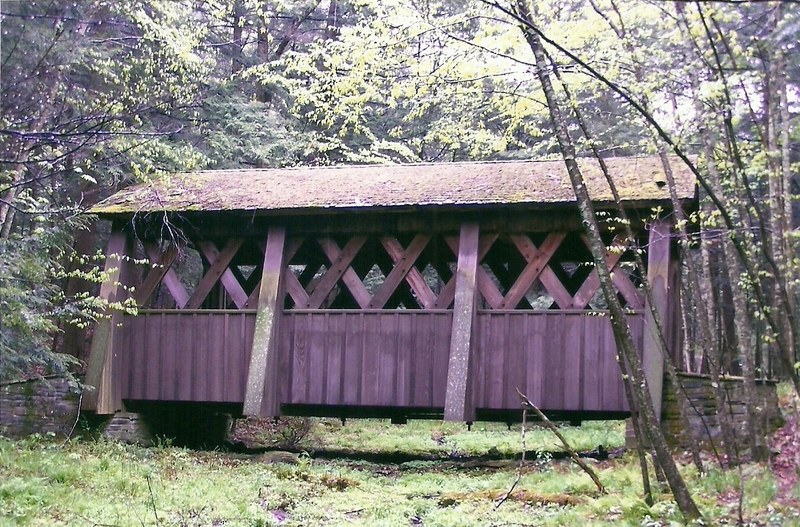 Built by Seager Fairbairn in 1964, this 31-foot-long, single span structure incorporates the Town lattice truss design patented on January 28, 1820, and again in 1835 by Ithiel Town of New Haven, Connecticut. 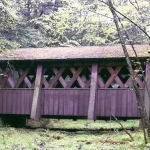 The Erpf Covered Bridge is very similar in dimensions and design to other bridges in the Catskill region, all of which feature buttresses. The Erpf has four such buttresses on each side. The total cost to build the Erpf Covered Bridge in 1964 was $5,000. The Erpf estate had its beginning in the early 1900s when Dr. Lefkovic, a general practitioner, was staying at Locust Grove during the summer. One day he chose to take a walk in the vicinity of the present estate and thought it would make a wonderful place for a home. He bought the first fifteen acres and in 1910 hired Merce Van Wagoner to construct a majestic home. Continuing to add to his acreage, he purchased adjoining land until he was owner of 400 acres. Dr. Lefkovic later changed his name to Erpf. After he died, his son, Armand Erpf, added more land to the holdings until it encompassed 508 acres. In 1963, Armand suffered a heart attack and wasn’t well enough to walk about his property, so he hired Seager Fairbairn to build the Erpf Covered Bridge. As a beginning, Fairbairn used the metal rods saved from the dismantled Vermilyea Place Bridge. He designed and turned his own, square-headed treenails (pronounced “trunnels”) and dipped them in a half-and-half mixture of linseed oil and kerosene. The criss-crossed lattice trusses and the gains were bolted on the tops and bottoms only. The exterior is redwood and the interior is fir. Its abutments are of perma-stone. 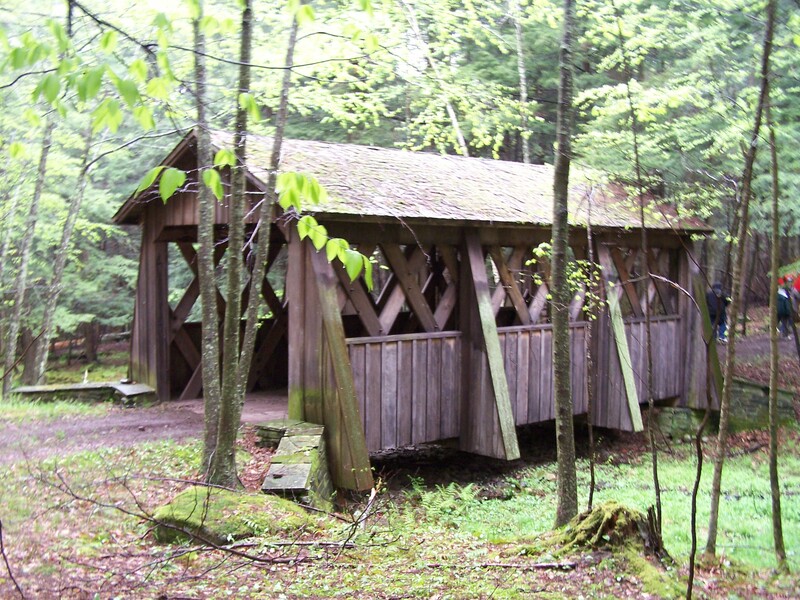 Also located on the property is a walkway covered bridge which measures 210 feet. It connects the guest house with the main house. This bridge is currently closed to all visitors. 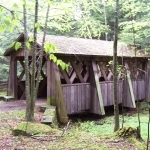 Excerpted and revised from Spans of Time, Covered Bridges of Delaware County, NY by Ward E. Herrmann.